One of the biggest complaints many dog owners have is their dog pulling during walks. This may lead to the owner no longer walking the dog or resorting to prong collars and other devices that supposedly stop pulling. However, even the most humane head halter can cause injury if not used properly. I have seen more than my share of dogs lunge and get their heads snapped back or even manage to get out of the halter and run off. I like to use a method of teaching loose lead walking that gives the dog a chance to decide what proper leash manners are. I use the dog’s natural desire for interesting things and attention to encourage the manners I want. This can be done regardless of the breed, cross or age of the dog. The determining factor in the technique’s successfulness is the owner. First, get a twelve to fifteen foot lead (not a retractable one, they have no control, the cord can cut your hands if you have to manually get the dog back to you in an emergency and you want something that remains loose). You can even use a light piece of cording for toy breeds. Second, get a lot of treats that the dog cannot resist and use them ONLY for training. Third, go to an area with very limited distractions. The more things going on, the less interesting you will be and the more likely the dog will be to lunge. Working in an area with too many things going on often leads to human frustration and too many corrections. The less going on when first starting to train any new behavior or desired manners, the better for the dog. He will be more likely to focus on you and not the ball game going on across the field or the joggers or the bikers, etc. Leash up the dog and give a happy "Let’s Go!" and start walking. If the dog goes in one direction, you walk in the opposite direction and SAY NOTHING. You need to TURN OFF. You do not want to follow the dog as this puts him in charge of the walk and in charge of you. When you feel the lead go taught, stop and walk towards the dog. If he starts to walk away, silently go in another direction. When you come up to the dog or the dog decides to follow you and gets right where you want him TURN ON, pay attention to him, give some treats and change direction. If the dog follows you, pay attention to him. The moment he starts to walk away, turn off and get boring. If the dog walks up to you or even accidentally hits the spot you want him in (like he is just walking past you), turn on, give treats, talk to him happily and get fun. When he turns away, turn off. If he walks away from you, change direction. If you feel the lead get taught, turn and walk towards the dog. What you are doing is using the dog’s natural desire for fun things to teach him fun and good happens when he is walking next to you. When he walks away, things get boring. He has the length of the lead to decide to walk away or return to you before it gets tight (he self-corrects when he makes the wring decision, your turning towards him give him a chance to make a decision that will get him something good). There is no leash yanking, dragging, yelling, no prong collars, etc., this can be done on a flat buckle collar or martingale ("greyhound collar) and should be as you are not trying to correct the dog into walking with you on a loose lead but giving him incentive to learn proper leash manners. When he is good at this with limited distractions, gradually increase the distractions. Remember, the more distractions, the harder you have to work to be more interesting than the rest of the world. 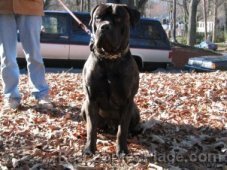 You are allowing the dog to learn leash manners without punitive methods. The dog learns that when he is near you, good things happen. When he is away, you shut off. No punishing, he just gets nothing. Most dogs love attention and will do what they need to in order to get it. Practice this on long leads and your regular lead (regardless of the leash length, the concept is the same). If your dog starts pulling, turn off, walk in the other direction and turn on only when he is where you want him. The more you practice, the better the dog will become. 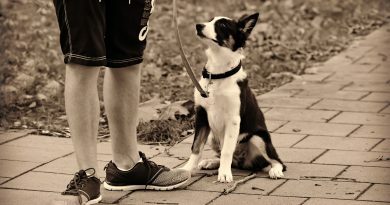 Do several short sessions a day and even when out and doing fun walk, use these techniques (even if it means your whole walk is spent going in circles, if you do not teach that proper manners apply at all walks, the dog will not learn good leash manners). Again, you are using the dog’s natural desire for fun and attention as a reward (or punishment when you turn off and grow instantly boring) in order to teach that loose leashes are FUN! Now what about those treats you are doling out? When the dog begins to spend more and more time next to you, gradually decrease the amount of times you treat. The dog will stay with you because he knows this will get him fun stuff, talking and maybe even food. He will be more likely to stay with you if he now gets the rewards at random times: sort of like slot machines and humans. Slots are so addicting because we know that is we do X behavior, we will get Y reward: we just do not know when and how much it will be. If you stop rewarding totally, the desired behavior will die off. If you reward too much once the desired behavior is figured out, the dog will try to do less work because he knows that reward will come anyhow. If you practice regularly during general walks and formal training sessions, you will develop a dog that walks happily on a loose leash. So, next time your dog starts to pull on his leash, shut up and walk away!